RF Safe rebuts the common misconception reported by media that Hands-free Headsets are hailed as one of the best ways to reduce overall cranial exposure from cell phone radiation by increasing the distance between the phone and head. 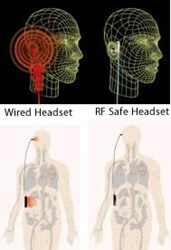 RF Safe is going on record to correct mainstream media's reporting that using a wired-headset is a good way to lower phone radiation exposure to the brain. As this most recent study has proven cell phone radiation exposure does effect the brain under even low exposure levels. It is imperative that the public understands the truth about wired-headsets and how to reduce RF exposure from cell phones. This misinformation being reported by mainstream media is putting cell phone users at much greater risk of cell phone radiation emissions. Believing wired-headsets are a safe alternative to placing a phone against their head, many people use hands-free headsets and attach the phone to their belt or purse. Radiation travels through the wire connecting the phone and earpiece and penetrates the head directly through the ear canal. This has been proven to increase radiation exposure to the brain by 300%. Simply put, wired hands-free kits for cell phones do not protect your brain from radiation - on the contrary, they channel three times the dose into the skull that you receive by holding the phone next to your ear, according to the UK Consumers' Association. The researchers found the wires leading from the phone into the ear acted like an aerial antenna, conveying a more concentrated dose of radio waves than usual. The Consumers' Association says the findings on the hands-free kits were a surprise. “If you're worried about levels of radiation from your mobile phone, you shouldn't rely on a wired hands-free set,” said Graeme Jacobs, editor of Which? RF Safe sells a safe cell phone accessory package that provides cell phone radiation protection that addresses three major areas of radiation exposure when using a headset. This package includes an air-tube headset and a pouch that shields radiation from your body when the phone is in your pocket or purse. As an added level of RF protection, the package also includes a clip on Ferrite filter that further reduces the amount of microwave frequency radiation that can travel up the headset wire across a cell phone user’s torso. RF Safe claims this is especially important for pregnant women or those trying to have children. RF SAFE is the world's premier provider of cell phone radiation protection accessories and informational data. Since 1998, RF (Radio Frequency) Safe has been dedicated to evolving the wireless industries safety standards, by engaging in the business of design, testing, manufacture, and sale of safety technologies to mitigate harmful effects of cell phone radiation!